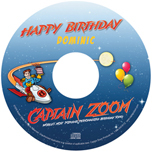 Sung to the delightful tune of our birthday song, Captain Zoom® toasts the couple but with appropriate lyrics for their anniversary. This custom anniversary gift will be long remembered and appreciated. 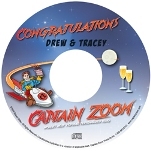 This novel gift is a delight for the anniversary couple and is a great keepsake for a lifetime of memories. Please allow 3 days for the customizing of the anniversary song. For special handling or to expedite, please call 1-800-543-9112.